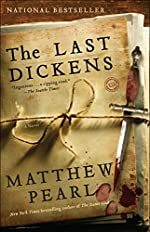 Mysterious Reviews, mysteries reviewed by the Hidden Staircase Mystery Books, is publishing a new review of The Last Dickens by Matthew Pearl. For our blog readers, we are printing it first here in advance of its publication on our website. Review: Matthew Pearl blends fact and fiction, and posits a plausible solution to mystery surrounding Charles Dickens' final, unfinished novel The Mystery of Edwin Drood in The Last Dickens, the author's third suspense novel to feature historic literary figures. Dickens' novel relates the story of Edwin Drood, an honest if sometimes disturbed young man, who vanishes after provoking the anger of his devious uncle. Dickens had promised his publishers, Fields and Osgood in Boston, that the book would have a curious and new ending. The publishers had been serializing the novel monthly in their trade magazine, anticipating a total of twelve installments. Six of a twelve installments had already been printed. The final installments were en route from London to Boston when Dickens died. A young man from the publishing company, Daniel Sand, was sent to accept delivery of the package at the wharf. After he signs for it, but before he can deliver it, he is killed and the package disappears. James Osgood has a few mindful questions: Who knew the package of installments was aboard the vessel? What could the thief gain by stealing the package? No one could publish the work as it would immediately be discovered. Believing the package to be irrevocably lost, Osgood decides to go to London to determine if there might be other copies of the novel in Dickens’ workroom. Maybe he had told someone about the novel and how the mystery would end. Before he leaves, though, Osgood is reminded by his partner Fields that the purpose of his trip is solving the mystery of the Edwin Drood manuscript, not to create a new mystery of his own making. This fictional literary mystery within a factual literary mystery is absolutely captivating. Daniel's death appears to be accidental, but he was fleeing from someone with a menacing cane, one with the head of a horned beast, when he's run down by an omnibus. A lawyer, Sylvanus Bendall, is nearby and tries to help, but can do nothing before Daniel dies. Bendall takes possession of Daniel's package and realizes immediately what it is, and how valuable it potentially is. In the meantime, Osgood sails from Boston to London accompanied by Daniel's sister, Rebecca. On board, he's attacked by someone with an identical cane possessed by the person who stalked Daniel. While in London, Osgood and Rebecca are taken through underground tunnels, ghastly opium dens, and anywhere else literary pickpockets and bookaneers frequent, all in an effort to locate a copy of the missing novel. Atmospheric and cleverly plotted, The Last Dickens is a brilliant novel that proposes an innovative solution to one of the literary world's most enduring mysteries. Readers will have a hard time putting down. Special thanks to guest reviewer Betty of The Betz Review for contributing her review of The Last Dickens and to Random House for providing a trade paperback edition of the book for this review. If you are interested in purchasing The Last Dickens from Amazon.com, please click the button to the right. Synopsis (from the publisher): Boston, 1870. When news of Charles Dickens’s sudden death reaches his struggling American publisher, James Osgood sends his trusted clerk, Daniel Sand, to await the arrival of Dickens’s unfinished final manuscript. But Daniel never returns, and when his body is discovered by the docks, Osgood must embark on a quest to find the missing end to the novel and unmask the killer. With Daniel’s sister Rebecca at his side, Osgood races the clock through a dangerous web of opium dens, sadistic thugs, and literary lions to solve a genius’s last mystery and save his own – and Rebecca’s – lives.